Despite Copernicus's heliocentric model being rejected by the Church as well as renowned astronomers of the day (such as Brahe), two famous Astronomers: Galileo and Kepler, were supporters of this model. Galileo is famous for being the first person to use the telescope in 1609 (a then recent invention) to observe the skies through which he saw craters on the moon (disproving Aristotle's theory of celestial bodies being perfect and spherical, and the moons of Jupiter (proving that some heavenly bodies revolved around objects other than Earth). However, he was also important for being among the first to disagree with the common view of accepting Aristotle's work without evidence to support it. Galileo performed many rigorous experiments, as well as the famous thought experiment suggesting that bodies of the same shape will fall at the same speed, regardless of their weight. This was to prove useful later when Newton came to consider his theory of gravity. Kepler marked the shift between how celestial objects move to why they move. This conceptual shift led to dramatic changes in the field of astronomy, away from the ancient Greeks who tried to develop a geometric model that described the path of the planet. Kepler looked to explain why the planets took the paths they did. In doing so, he theorised in 1609-21 that celestial orbits were ellipses caused by some physical force that was pushing the planets along its path. Following these trailblazing men, there was a small gap in astronomical advances, perhaps in part due to Galileo's summons to trial by the Pope and subsequent house arrest for the remainder of his life as a result of his 'heretical' views. In 1650 Descartes built on Kepler's ideas to say that tides were caused by the force from the sun and moon and in 1681 Flamsteed recognised that comets had a closed orbit and so were terrestrial objects rather than celestial. Newton, who had originally believed that comets were celestial went on to realise that their orbits were highly elliptical or parabolic in nature. Newton is, of course famous for his theory of gravitation which allowed scientists to make remarkable predictions, such as the existence of Neptune. 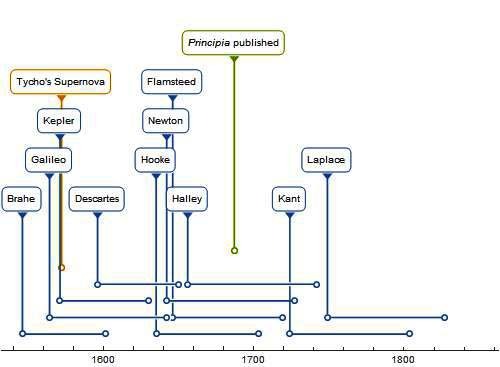 His theory increased the plausibility of a Keplerian, non-geocentric, model of the solar system [See: Structure of the Solar System] by providing a physical explanation for Kepler's laws, and was revolutionary in that it changed science from describing physical phenomena to predicting them. Experimentally, Newton noted that white light was made up of different colours which, 150 years later, would stimulate spectroscopy and the rise of Astrophysics. Halley played a significant role in Newton's advances, as a debate with Hooke led him to bring his questions and support to Newton, and then to finance the publication of the Principia personally.